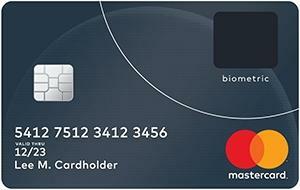 MasterCard's biometric payments card combines chip technology with fingerprints. Mastercard has introduced payment cards with biometric capabilities, which it first trialled with a South African supermarket retailer and bank. The new biometric payment cards, which were tested among Pick n Pay and Absa employees, combine chip technology with fingerprints to verify the cardholder's identity for in-store purchases. In a statement, the global payments company says the cards build on fingerprint scanning technology used for mobile payments today and can be used at Europay, Mastercard and Visa terminals worldwide. "Consumers are increasingly experiencing the convenience and security of biometrics," says Ajay Bhalla, president, enterprise risk and security at Mastercard. "Whether unlocking a smartphone or shopping online, the fingerprint is helping to deliver additional convenience and security. It's not something that can be taken or replicated and will help our cardholders get on with their lives knowing their payments are protected," adds Bhalla. To make use of the biometric card, the cardholder enrols their card by registering with their financial institution. Upon registration, their fingerprint is converted into an encrypted digital template that is stored on the card, which will enable them to use it at any EMV card terminal globally. With regards to shopping and paying in-store, the cardholder dips the card into a retailer's terminal while placing their finger on the embedded sensor. The fingerprint is verified against the template and - if the biometrics matches - the cardholder is successfully authenticated and the transaction can then be approved. Richard van Rensburg, deputy CEO of Pick n Pay, explains: "We are delighted that this innovation has been trialled for the first time at Pick n Pay stores in South Africa. Biometric capability will mean added convenience and enhanced security for our customers. The technology creates a platform on which we can further our strategy of personalising the shopping experience in a meaningful way. We have been extremely impressed with the robust and secure nature of the technology." Absa, whose employees also participated in the trial, says the biometric card forms part of the bank's strategy to test and develop sophisticated technology capabilities designed to improve its payment operations and client service, reduce risk, and make banking easier and more secure for its customers. Geoff Lee, head of card and payments at Absa retail and business banking, states: "The technology will effectively enable our customers to rely on their unique fingerprints to make payments in a face-to-face environment. Following the test period, we will make it available to our customers in a way that is affordable, reliable, convenient, and, most importantly, secure." According to Mastercard, over the next few months, additional trials with the biometric card will be conducted in Europe and Asia Pacific. A full rollout is expected later this year, the company says.